In my previous post, I introduced Performance Co-Pilot (PCP). I know, I promised the next post to be about logging, but I thought I’d make a short detour and show how to install more PMDAs. After installing PCP on a Linux system, you will have access to somewhere around 850 various metrics from the three basic PMDAs (pmcd, linux, and mmv). There are many more metrics that you can get at if you enable some of the non-default PMDAs. I pondered what the best way to present a simple howto would be, and then I realized that simply copying & pasting a session where I install a PMDA will do. First of all, all the PMDAs live in /var/lib/pcp/pmdas/. In this post, I will use the PowerDNS PMDA as an example, but the steps are the same for the other PMDAs. 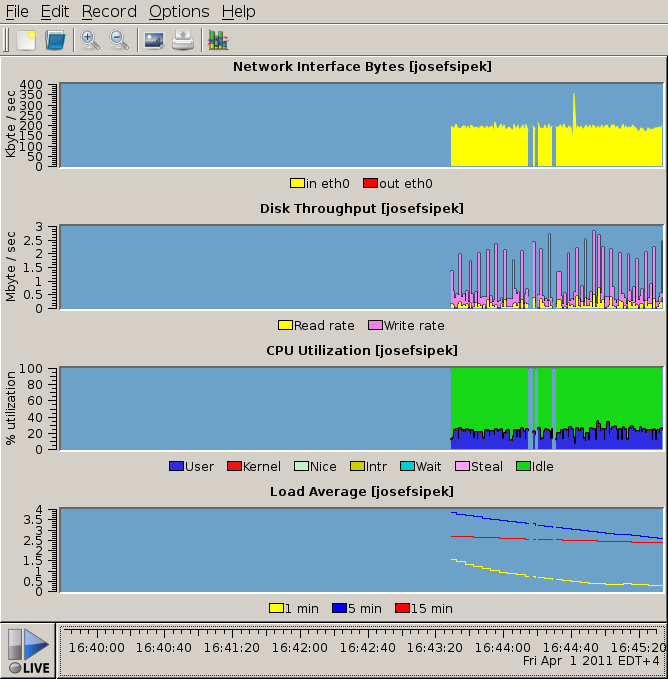 the "pdns" Performance Metrics Domain Agent (PMDA). If you decide to uninstall a PMDA, just cd into the directory and run the Remove script. Performance Co-Pilot (PCP) provides a framework and services to support system-level performance monitoring and management. It presents a unifying abstraction for all of the performance data in a system, and many tools for interrogating, retrieving and processing that data. If you ever administered a server, you know that there are times when you want to know answers to pretty simple questions: what’s the load average on server X, or what’s the current network utilization on server Y, or memory usage, number of processes, number of logged in users, disk bandwidth usage, filesystem usage, etc., etc. You may have written some scripts that try to answer those questions, or used some of the other monitoring frameworks out there (e.g., Ganglia, Cacti). PCP is rather unique in the way it handles monitoring. PMDAs (short for Performance Metrics Domain Agents) are metric collectors. Each PMDA knows how to retrieve certain system information. For example, the Linux PMDA knows how to parse all the information in /proc, the PowerDNS PMDA knows how to get statistics from the PowerDNS daemons, the MySQL PMDA knows how to get stats from MySQL, etc. There are 35 different PMDAs installed that cover various often used daemons and system services — Apache, KVM, lmsensors, memcached, MySQL, Bind, PowerDNS, Postfix, Samba, Sendmail, VmWare, Zimbra, and more. PMCD (short for Performance Metric Collector Daemon) is responsible for answering client (see below) requests for metrics, and calls into the various PMDAs to retrieve the requested metrics. The various pieces of client software contact the PMCD (via TCP/IP) and request one or more metrics. Why not use Ganglia/Cacti/other rrdtool-based software? As is stated on the rrdtool website, rrdtool is a high performance data logging and graphing system for time series data. So, why not use it? First of all, rrdtool doesn’t collect data; it merely stores it for later retrieval or graphing. This means that if you want to collect data, you still need something to collect it with — a script that parses /proc files and hands the values to rrdtool for storage. Cacti and Ganglia are just two examples of the many rrdtool-based system logging solutions. Personally, I find them to be a bit too heavy weight (why do I want PHP and MySQL on my logger server? ), cumbersome to use (e.g., clunky web interfaces), and just not flexible enough. Additionally, PCP supports Linux, Solaris, Mac OS X, and even Microsoft Windows. You can use the same tools to monitor your entire network! SNMP is a protocol that exposes a hierarchy of variables that often include some performance metrics (e.g., the number of bytes and packets transfered over a network interface). If, however, you want MySQL statistics, you need to write your own stat extractor that feeds it into the SNMP daemon — not very hard, but it still takes some effort. In this series of posts, I hope to demonstrate to you that PCP is superior to these solutions. Debian is my distro of choice, so I’m going to make some Debian-centric assumptions. Distros that are Debian derivatives (e.g., Ubuntu) should have a package as well. Fedora, RHEL, and SLES have packages as well. At the end of installation, the Debian package automatically starts the PMCD. Now that we have PCP installed and running, let’s query it for the list of metrics. We’ll use the pminfo utility. By default it assumes that we want to query the localhost. We can see that pminfo returned 3 values — called instances in PCP speak. I should note that some of the metric values don’t seem to make much sense unless you already know what they represent. Have no fear! pminfo has two arguments that display a short (-t) or a long (-T) help text. For example, the following command will tell us what what kernel.all.load keeps track of. You can use pminfo to fetch all the metrics you want, or you can use one of the other utilities which do some additional magic. Fri Apr  1 16:15:36	?	? The first column contains the date and time, the remaining column are the time-converted metrics/instances. That is, between each line of output, PCP calculated the average utilization and printed that out. The arguments (-m and -u) print the first two lines of the output — the name of the metric/instance, and the units. pmdumptext gets the units from the PMCD along with information whether or not it should rate convert the values (it will rate convert “bytes” to “bytes/sec”, but if there is a metric representing the current latency it will leave it alone). Next time, I’ll cover PCP’s logging facility. Recently, I wanted to figure out whether or not an application I was analyzing was memory bound or not. While on this quest, I was introduced to Performance Application Programming Interface (PAPI). There is a rather good HOWTO that shows step-by-step instructions on getting it all running on Debian. The text below is more or less just a short version of that HOWTO, with my thoughts interspersed. PAPI is a library that hooks into the hardware performance counters, and presents them in a uniform way. Installation is rather simple if you pay attention to the installation instructions. That’s it for PAPI. The make fulltest will run the tests. Chances are that they will all either pass or all fail. If they fail, then something is wrong (probably with perfctr). If they pass, then you are all set. There are some examples in the src/examples directory. Those should get you started with using PAPI. It takes about 100 lines of C to get an arbitrary counter going. Some other time, I’ll talk more about PAPI, and how I used it in my experiments. Every so often I needed to extract a .deb package manually. Usually I ended up installing Midnight Commander, and used it to copy the contents out. This time around, I did some search, and found a straight forward description how to do it for .debs and .rpms. Almost 6 months ago, I wrote up another howto: Installing CentOS 4.x under z/VM (the first one being Installing Debian under Hercules). I finally managed to find few minutes (well, about 2.5 hours) to write down and test my first howto. It is about…*drumroll*…Installing Debian under Hercules. For those of you who don’t know, Hercules is an emulator for the System/360, 370, 390, and zSeries IBM mainframes. Have fun, and let me know if you have any suggestions how I could improve the howto.